Diervilla sessilifolia 'Lpdc Podaras' or known by its marketing name Diervilla sessilifolia Cool Splash® was introduced by First Editions®. 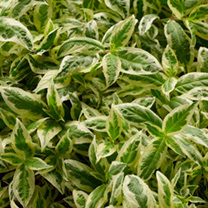 Cool Splash® is an upright, suckering, thicket-forming, deciduous shrub with ovate to lance-shaped, pointed, mid-green and white, variegated leaves and its bright white stands out dramatically, even in shady borders. Clusters of small yellow flowers in summer. This easy to grow variety can be used in woodland settings or mass plantings for a spectacular effect. Height 90-100cm.